Desert Racer: The big thaw and recovery week? This week was supposed to be a recovery week. However, I’ve still managed to rack up about 35 miles, so it’s not really lived to the aim! It started well, in that whilst working away from home on Tuesday I ran my 3 mile speed session. My GPS didn’t record the time, as I managed to stop the clock after the first mile by accident. Still it felt a reasonable enough pace, nothing that quick, but I’d guess about 7:20 min miles. On Wednesday I got a little lost and ended up running 7 miles instead of 8. However, I got equally lost the following morning and ended up running almost 9 miles instead of 8, so that all balanced out. All of those runs were on the road, through what was the big thaw that is now taking place. The roads and paths were still icy, but much of it was turning to slush. The run in on Thursday morning was carrying a reasonably lightweight pack of a few kg. On Saturday my gf and I decided to do a walk in the Peak District around the Roaches area. You can see our route map below. Someone had forgotten to tell the area that a thaw was taking place, so on the lower ground most fields were fairly clear, but the higher we got the snow got deeper, and at the fields boundaries there were some pretty big snow drifts of up to about 4 or 5ft in height. It was also very foggy, as you will see. The first part of the route descended slightly and was through fields. The snow was patchy here. We made pretty good time, but as we began to climb and hit more snow things slowed down. I’d forgotten how tiring it is to walk through snow that is about 6 inches deep or more. So, my nice gently walk turned into more of an expedition as it got colder and foggier in addition to the more challenging terrain. 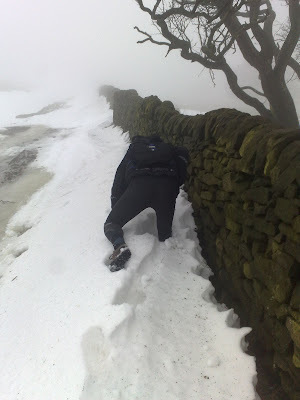 This wasn’t helped by us deciding to deliberately staying close to the field walls where the snow was deeper. I of course decided to ridge walk the deepest drifts for fun; this invariably involved sinking up to my thighs in snow! Eventually we began the climb to the trig point at Roach End. There was no thaw whatsoever here. The snow was everywhere, still thick and icy and it was much colder. It had taken us longer than anticipated to get to this point of the walk, and as a result the light was beginning to fade. We took a few photos at the top, which is around 500m if memory serves. Normally there are great views over Staffordshire, Derbyshire and further afield but not today, just fog. We started to walk along the ridge which has a cliff on one side, popular with climbers in better weather). In the fading light, fog and snow it was very difficult to find the path. We only went about 200m along the top when I decided it wasn’t a good idea to continue. It was only around 1.5 miles along the ridge and down, but from a safety perspective, and the possibility of injuring myself at a time when my training is hitting the peak, it didn’t seem sensible to go stumbling along a snow covered ridge in the dark and fog. We returned to the trig point and descended the way we came. The snow thinning out a little as we got lower down. We reached the road which runs below and parallel to the ridge, and which had been cleared by a snowplough. We were both feeling a little cold, as it was well below zero with the height and wind. So, we decided to run the last 2 miles back to the car along the road. So, less than 20 minutes later we were back at the car just as it was getting dark. We had made a good call. Progress along the top would undoubtedly have been much slower and descended down from the ridge can be a little treacherous even in much better conditions. We stopped at the nearby Three Horseshoes pub on the way back for some tea/coffee before heading back home. We had covered 8 miles and 1550ft of ascent. The following day I had a 10 mile steady run planned, but we had arranged to visit a work colleague of my girlfriends; a couple who are both very good ultra distance runners . The girls went out for a run first, and the boys went out afterwards. They live in a lovely part of Shropshire at the foot of a 1000ft climb. It is about 2.5 miles from their house to the top, which is a pretty good height gain for a run in such a short space of time. The guy I was running with is a far more accomplished runner than me, and well practiced at stile hurdling. He literally plants one hand and hurdles the entire stile, whilst I step over it as walkers do. I must try harder! I soon found out what my lungs were for as the climb rose through the fields and woods. He certainly didn’t run anywhere near the limits of his ability, as I puffed my way up the hill behind him. Still it was a more or less non-stop run, just punctuated by a couple of stiles or gates to get through. I can see how he is as fit as he is, if he climbs that hill in every run, which I understand he more or less does! There was still a lot of snow on the hill, up to about 6 inches on most of the top, deeper drifts in places. Once on the top, we ran at a much better pace, though I still have to practice my snow running as I just can’t cross the ground quite as quick. We got to the Beacon at the top, where I took this photo. This doesn’t do any justice to the amount of snow that was up there underfoot! We then headed down slightly on the snowy paths. It was lucky dip as to if your feet went 4 inches or a foot through the snow with every step. We headed back up to another hill and beacon, and he pointed out some swallow holes (left over from mine works) which had been hidden and snow covered. A few days previous, one of his neighbours had fallen in one, going right in and into the water beneath, and really struggled to get out. Dropping into icy cold water whilst on the top of a hill in sub-arctic temperatures must have been a pretty frightening experience. It got down as low as -17 there last week apparently! We then descended and headed along a forest track, all of which was snow covered still, then eventually met the path that we had ascended on, and headed back down and back to the house. I’m not entirely of the route that we took, so I have taken my best guess, which is shown below. I think we were out running for an hour and 20 mins or so; so my best guess is that it was about 9 miles, and took in just over 1500ft of ascent. I really enjoyed the run, even though my recovery week plans were not quite as restful as I intended! The next few weeks are my big miles weeks. 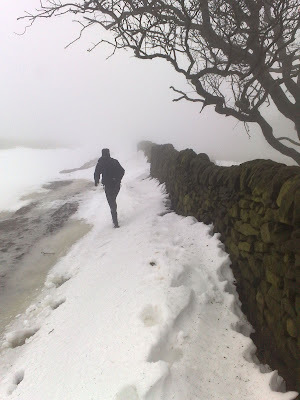 46 miles this week, including an event; The Hebden on Saturday. I've done the race twice previously. 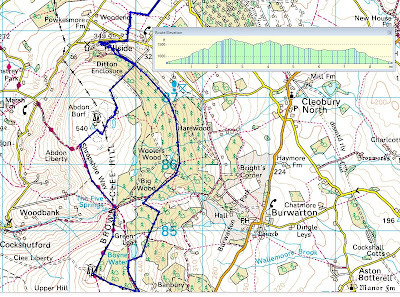 It's around 23 miles with over 4000ft of ascent. I'm looking forward to the challenge once again. almost 70 miles the week after, including a 44 miles run from Wolverhampton to Newcastle in Staffordshire. 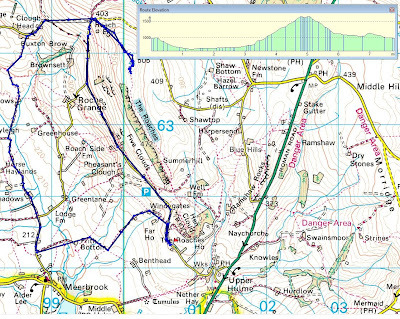 Then a recovery week of 30 miles, followed by 49 miles the week after, including another event; The Anglezark Amble which is also supposed to be tough. It's going to be an interesting few weeks of challenging training. I need to remain injury free and use these last few big weeks to boost my endurance, before I work on my speed and overall fitness in the final few weeks before the Atacama Crossing 2010.